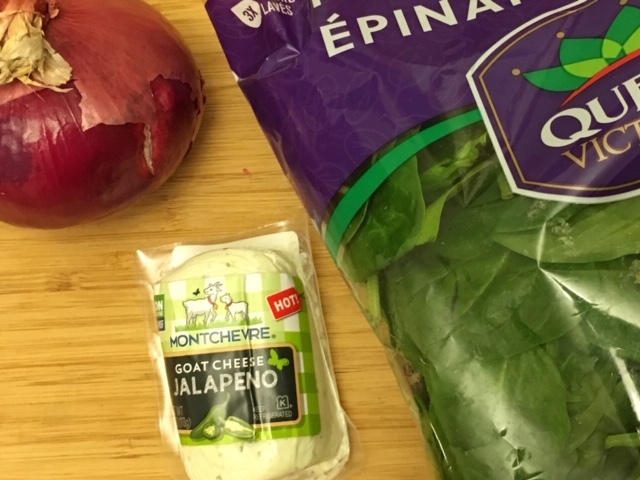 I'm not a goat cheese lover but I got a chance to try Montchevre goat cheese and decided to try the jalapeno goat cheese because I love spicy foods. The Montchevre company was founded in 1989 in cheddar country in Preston Wisconsin. In fact, the Montchevre goat cheese facility used to be a cheddar cheese factory. Montchevre is the largest goat cheese company in the United States. For more information on goat cheese and the Montchevre company check out their site, products, and faqs. I'm lactose intolerant I was afraid to try it but because of how most cheeses are fermented, they have less lactose and that especially includes goat cheese. Goat cheese is high in calcium, vitamin D, protein and other nutrients and vitamins. Since I'm concerned about holiday weight gain, I have a recipe that will not have you worried about those extra Christmas meal calories. I decided to make a stuffed chicken breast using Montchevre jalapeno goat cheese. The stuffed chicken breast was easy to make and it turned out very tasty. If you want something different for your Christmas dinner, go ahead and try the recipe below. Preheat the oven at 350 degrees. Prepare a baking sheet by lining with foil, set aside. Place chicken breasts in the oven and bake for 25-30 min. If desired switch oven from bake to broil for the last 10 min. of cooking for a crisper and browner topping. You can use skinless boneless chicken breast if desired. Thanks and it was delicious.